A new pocket material reference guide that lets users see, feel, and test popular materials, adhesives, and product I.D. label design options is being offered by Nameplates For Industry, Inc. of New Bedford, MA. 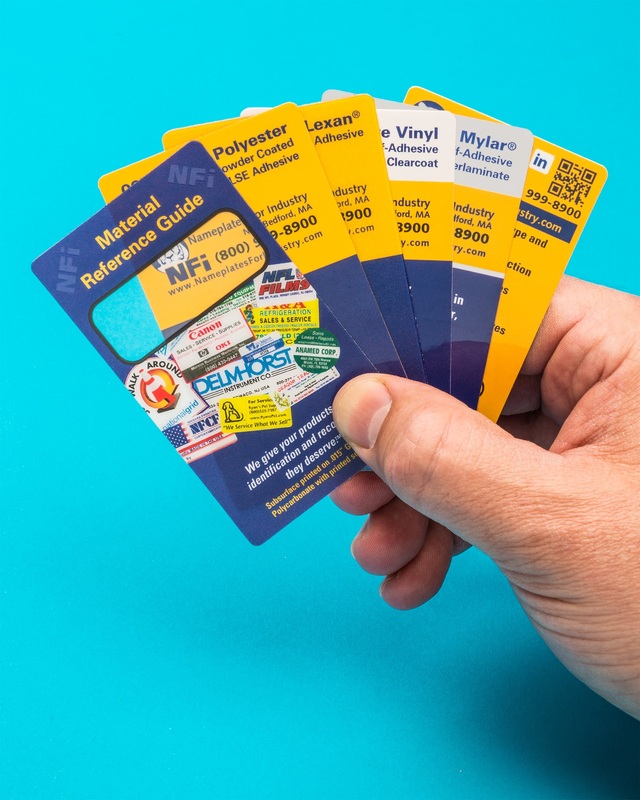 The NFi Material Reference Guide consists of six business card sized samples featuring different materials, finishes, and adhesives, along with typical application photos to help users select the best options for their product identification requirements. Fully illustrating durable subsurface printing on each material sample, one card describes a summary of products, services, capabilities, 3-5 day prototype program, and UL, CE, and other approvals. Included in the NFi Material Reference Guide are samples of clear windows, gloss polycarbonate with printed selective texture, .020” Textured Lexan® with .005” adhesive, .005 Gloss Polyester with .002” powder coated LSE adhesive, .004” White Vinyl self-adhesive with a glossy clearcoat, and .002” Silver Mylar® self-adhesive with a glossy overlaminatate. The NFi Material Reference Guide is available free by phoning (800) 999-8900 or visiting www.NameplatesforIndustry.com.